The Colonial Viper is the primary fighter spacecraft type used by the human protagonists in the Battlestar Galactica fictional universe. Appearing in both the 1978 original series and the 2003 reimagined series, as well as various derivative works, the single-pilot spacecraft are carried aboard Battlestar Galactica and are the human's main tools of defense against the fictional universe's antagonists - the cybernetic Cylon race. The popularity of the original Battlestar Galactica series resulted in United States Air Force pilots nicknaming F-16 Fighting Falcons "Vipers". When the reimagined series was created, the Viper was one of the elements the designers wanted to carry through with minimal alteration. This kit has been much anticipated by those into sci-fi in general and Battlestar Galactica in particular. It is molded after the Vipers in the 2003 series and is particularly well molded. I found no molding glitches of any kind in the crisply done white plastic. 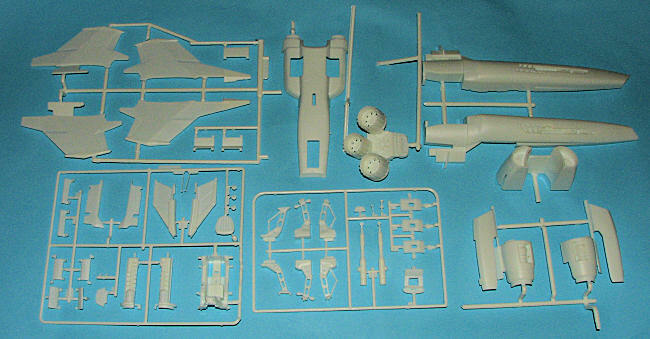 The folks at Moebius are taking the more minimalist approach to things as there are not a ton of parts. It is no snap-tite, but it isn't an 800 part Dragon kit either. The kit can be built with the landing skids retracted if one wishes. In this case, the closed gear doors are inserted from inside the wings and fuselage (the fuselage is split horizontally), a nice touch that makes things easy. Of course, it means one has to make a decision early in the build. The kit does come with what appears to be a resin pilot figure just for this option. It also comes with a stand that is a direct copy of all the Aurora stands I've ever seen in my favorite line of kits from the 60s when I was much younger. The instructions are on full color slick paper and superbly done. In addition to drawings, there are photos and a step by step printed set of instructions as well. Any possibly confusing areas are printed in red so you can pay extra attention. 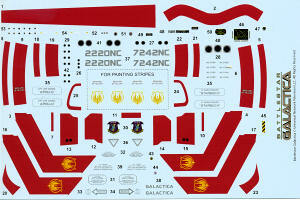 The decal sheet is superbly printed and includes the markings for the box art Viper. All of the stripes are decals though some may want to paint those on. For those folks, additional badges for the wings are included. Even pilot patches are part of the sheet. The painting and markings portion of the instructions has color references in the three major lines that Testors produces. I have to say that this one is a winner. Sci-Fi fans will want to snap this one up as it clearly supersedes the older original series kit put out by Revell. Pawn that one off on a kid who will be pleased to get it and won't care about how hard it is to build properly.